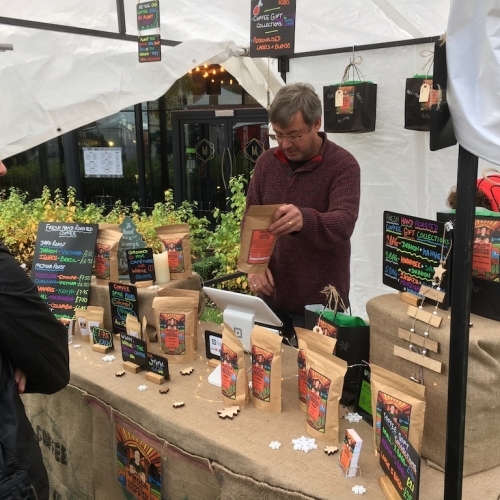 Yorkshire based Artisan coffee roaster, using faitrade, organic and rainforest alliance green coffee beans from small farmers and co-operatives that help support the coffee farmers families and environments. Freshly roasted coffee to order using the freshest green beans from all over the world. Decaffeinated and 50/50 coffee available in a either whole bean or a selection of grinds. All our packaging is 100% biodegradable and compostable (including the valve and resealable strip).We also produce some very popular coffee spice rubs for meat and vegetables.Having survived a career in IT for over 30 years, I have naturally had to drink a lot of coffee! The more coffee I drank, the more interested I became in the whole roasting process. I have spent many years studying and researching the art of coffee roasting. Buried deep in the cellar of my Yorkshire home, using green beans imported from all over the world, I have experimented with a multitude of different blends and roasts. Spurred on by family and friends I began to produce small batches to sell locally. I am passionate about roasting coffee that can be enjoyed whatever your taste. Having outgrown the cellar, I built a small roastery which enables me to produce the amounts of roasted coffee I need whilst still ensuring an artisanal, personal process.